The knee is one of the most complex and largest joints in the body, and is more susceptible to injury. 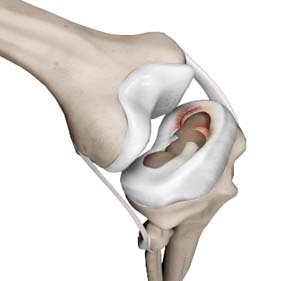 Meniscal tears are one among the common injuries to the knee joint. It can occur at any age but are more common in athletes playing contact sports. The meniscus is a small, "c" shaped piece of cartilage in the knee. Each knee consists of two menisci, medial meniscus on the inner aspect of the knee, and the lateral meniscus on the outer aspect of the knee. The medial and lateral meniscus act as cushion between the thighbone (femur) and shinbone (tibia). The meniscus has no direct blood supply and for that reason, when there is an injury to the meniscus, healing cannot take place. The meniscus acts like a "shock absorber" in the knee joint. A careful medical history and physical examination can help diagnose meniscal injury. The McMurray test is one of the important tests for diagnosing meniscal tears. During this test, your doctor will bend the knee in, then straighten and rotate it in and out. This creates pressure on the torn meniscus. Pain or a click during this test may suggest a meniscal tear. Your doctor may order imaging tests such as knee joint X-ray and knee MRI to help confirm the diagnosis.